For those of you who aren’t familiar with last year’s design, it’s the result of an international competition ran by the city of Lausanne. What GMP Architekten presented with their Swiss partners is a football-specific stadium integrated into a larger building, with boarding school and closed natatorium, among other facilities. Today’s financial situation of Lausanne no longer allows the plans to go forward. It was thus decided that the sports infrastructure transformation will be a less impressive, but more rational one. 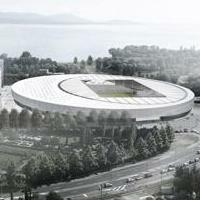 The current Stade Olympique de la Pontaise is expected to be demolished and replaced with football-specific stadium. A design competition is to be announced this year. This change means getting rid of the running track, which in turn forces Lausanne to provide an alternative athletic venue. This function will be taken up by very small Stade Pierre de Coubertin, standing by the Lake Geneva waters. It will have new stands and a possible temporary expansion, with regular capacity of 6,000 and double size increase, when needed.